It was a success! 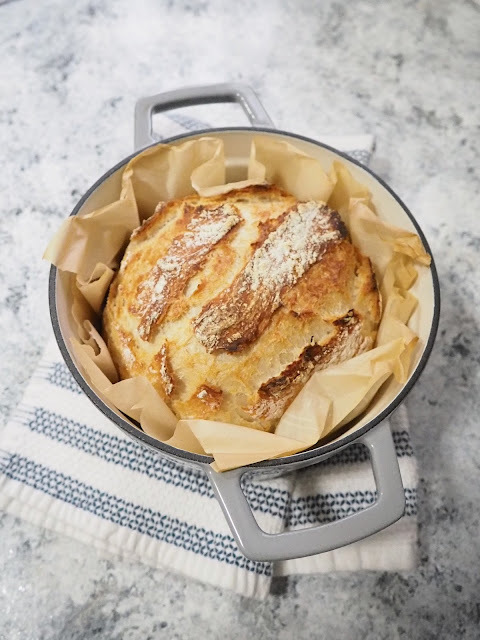 This might be the easiest bread you've ever baked! The ingredients are minimal and there is no kneading required. You basically mix everything together, let it set, then throw it in the oven! The end result is a crusty exterior with a soft and fluffy interior. I'm typically not a baker and again, any recipe that requires me to use yeast usually ends in disaster. This one is fool-proof though. I'd recommend you give it a try sometime - you just might surprise yourself with the results! mix the flour, yeast and salt together in a large bowl. mix in room temperature water with a wooden spoon or spatula - be careful not to over-mix. cover with plastic wrap and let the dough rise overnight (or 10-16 hours) - the dough should more than double in size. once the dough has risen, punch down and fold into a ball on a well-floured surface. let the dough sit on parchment paper for 30 minutes before baking. pre-heat your oven to 450 degrees. make sure your dutch oven is in the oven pre-heating, you don't want to place a cold pot in a hot oven, yikes! transfer the dough on the parchment paper into the hot dutch oven and bake covered for 30 minutes. bake another 15 minutes uncovered. and you're done! I found this recipe by searching "no knead bread" in google and pinterest. I kept seeing the same recipe/ingredients repeated over and over again. I slightly adjusted mine (adding less salt than the other recipes I encountered).